The teaching staff at Ebenezer school are busy as usual. In addition to education, they also have focus on teaching the students about other aspects of everyday life, like social behavior and Indian culture. The teachers are preparing and rehearsing with the students at school campus. This trimester is almost over and so the teachers are finalizing the result cards after the last examinations that have been completed. This is a time-consuming job and many of the teachers work overtime in order to get it done on time. September 5th, Ebenezer School celebrated the “Teachers day” together with many other schools around India. The day is celebrated for all teachers in all schools, but started with Dr. Radha Krishnan who throughout his whole career showed genuine interest in the students and teachers wellbeing even after he got a high position job. He would visit schools and colleges when he had the time to, to teach and interact. So, on the birthday of Radha Krishnan, the “Teachers day” is celebrated. At Ebenezer School, the children show teachers gratitude and respect in whatever way they want to. Some teachers were given cakes, gifts and flowers. The point of setting aside a day for this, is to teach the children more about the importance of love and respect for one another. At the end of the day, the Headmaster gives out a prize to the class that has given the “best honor” to their teacher. 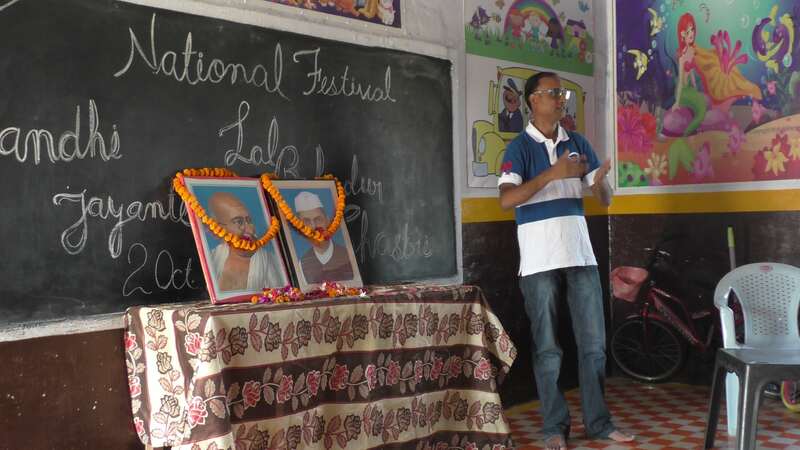 December 2nd, the schools gathered to honor Mahatma Gandhi for the freedom he gave India. The day began with hoisting of the national flag, followed by speeches and taking the time to remember and appreciate the value of freedom. At the end of the day, they all sang Gandhi´s favorite hymn; “Abide in me”, and ate together. Gandhi Jayanti, means “the birth of Mahatma Gandhi”. He is considered “the Father of the Nations”, and is celebrated immensely and wonderfully at Ebenezer School as also all over the country. This is a public holiday, so with the students celebrating at home, the teachers meet and have their own celebration. Mahatma (=”great”) Gandhi is celebrated for his relentless and dedicated service, in many aspects like welfare. He wanted freedom for his nation and against all odds, he made it possible. He believed in non-violence, such as winning wars through protests instead of weapons. Over time, tens of thousands started believing and supporting that what he said was possible. During this time, India freed themselves from British rule without any use of violence. The first examination for all the classes was held at Ebenezer towards the end of September. Examinations this early on, is more beneficial for the teachers to see how they´re students are doing. This was done in ten days, covering all the subjects the students have. After the ten days of examinations, all the students get a day off to rest. For the teachers on the other hand, a lot of exams need to be corrected. All these children are siblings, and belong to a family of a poor labourer. They live in the village of Banadi, about 2.5 kilometres away from the school. Their father´s name is Mr. Nutender Singh and he always dreamt of having his children go to a good quality school, but being the only one in the family with income, that has been challenging. Even putting food on the table has been difficult enough with the income they have. This summer, a team from Ebenezer School came to Banadi village where they met Mr. Nutender Singh. The teachers told him about the school and the ´Benefit Scheme´. He declined because he couldn´t pay the tuition fee. Later the teachers met the same man again on their “door-to-door” visit. After talking to the school management, they decided to cut tuition fees for two of the children. That way Mr. Nutender Singh would only have to pay half of what he was originally told. He immediately enrolled all his children to the school. Mr. Nutender Singh has decided to move to New Delhi with the intention of earning more money. Still, he is so happy and relieved that his children now get educated, and both parents see the educational development they´ve had. Mr. Chrote Lall has four children and live in a small hut in the village Kuli Talaiya, about 1,5 kilometres from school campus. The father is a poor man who gets his income from selling goods to a small shop near the District Hospital in Karwi. Mr. Chrote Lall had heard of the sponsorship program. As soon as Mr. Chrote Lall was given the opportunity, he enrolled all his children to Ebenezer School. He was so grateful that his children get the same opportunity that he got when he was younger, and wishing and hoping that many more will benefit from this project. After the time that the children have had at Ebenezer, their father sees growth in his kids, both mentally and physically.